If there's one thing we know you love about the Philippines, it's the abundance of beautiful beaches. While people from a good number of countries have to leave their borders just to set foot on sand and shore, we've got beautiful beaches everywhere. Two to three hours by car (from Manila to most Luzon beaches) or 30 minutes to a little over an hour by plane (everywhere else in the Philippines), and you'll be soaking up sunshine with the sound of crashing waves in your ears. You can visit a beach on next to no budget at all. But if you feel like treating yourself to a truly luxurious vacation, and you have a little money saved up and enough vacation days to really pamper yourself, take this opportunity to visit one of the Philippines' best resorts for that all-out summer experience. Escape to a tropical paradise and forget about your day-to-day woes. A trip to a resort like the Maribago Bluewater Beach Resort on Mactan Island in Cebu is the rejuvenation you need. For those who are looking for a well-deserved break from the daily grind, Maribago Bluewater offers you complete relaxation. Everything about the resort seems designed to take the weekday weight off your shouldersâ€”from the lush, green landscape and lovely foliage around the property, to their great spa services (which you can even avail of in a beachside cabana if you want to listen to the waves while you get a massage) and the comfort of your suite. Rooms go for anywhere from P7,000 a night (for the deluxe room) to P15,000 a night (for the Royal Bungalow), which includes a delicious buffet breakfast, a set meal at Allegro Restaurant for lunch or the theme dinner of the night, and practical services like free airport transfers (if you stay two nights). The in-suite bathrooms are huge, with skylights that let the natural sunshine in so that, even when you're cleaning up after a day in the water, you never forget that you're checked into an island paradise. You probably go to the beach to enjoy the sand and the water, and at Maribago Bluewater, there's a huge stretch of white sand to enjoy. 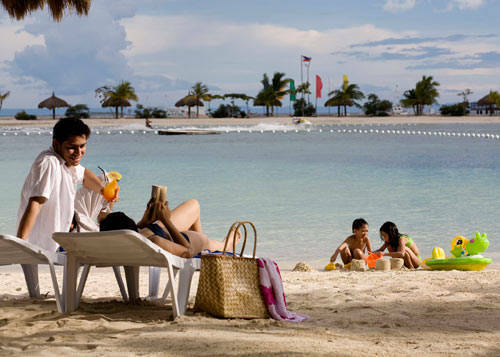 Spread a sarong or pull a deck chair from the nipa cabanas by the shore when you try to get a tan. Take a dip in the clear water. Close your eyes, listen to the sounds of nature around you, and let everything else just melt away. If that's not still not relaxing enough for you, check out Maribago Bluewater's Amuma Spa. Amuma is a Visayan word that means "pamper," and that's exactly what they do. The staff at Amuma Spa is friendly, attentive, and meticulous about their work. From how they wash your feet in lukewarm water with essential oils, to the careful way they knead the cares and worries out of your muscles, an Amuma treatment isn't just a massage; it's an experience. Try their signature massage, the Amuma Hilot (P2,500 for 90 minutes), which incorporates traditional hilot techniques that promote healing and wellness. They also offer standard massages like Swedish (P2,500 for 90 minutes) and Shiatsu (P2,000 for 75 minutes, P3,500 for 60 minutes of water Shiatsu), and all sorts of face and body care treatments. Another great thing about being on an island getaway is that, if you love seafood, the fare is absolutely fresh. Maribago Bluewater serves delicious international cuisine at Allegro Restaurant and their Italian resto, Molto Joli, but their Oyster Bar (which serves shellfish in several yummy ways and every cocktail you can think of) and The Cove serve the freshest, most scrumptious seafood. If you're a health buff, the Amuma Spa Juice Bar has all the healthy snacks and drinks you're craving. Every meal is a great dining experience, and there's something for everybody. Even the pickiest eaters will be totally satisfied. If you live an active lifestyle, you'll never be bored. Maribago Bluewater offers everything from scuba diving lessons (you can even become a certified diver if you take their Open Water Course for $350) and island-hopping banca tours (which come with snorkels, meals, and drinks, with the rate depending on the number of people joining the excursion), to wakeboarding (P5,400/hour), kayaking (P800/hour), and windsurfing (P1,500/hour with an instructor). Unleash your inner adrenaline junkie. All that on top of the beach and Maribago Bluewater's three swimming pools! Aren't you just dying for a vacation now? Click through to the gallery below to see pictures of Maribago Bluewater Beach Resort and all its amenities. You can find out more about Maribago Bluewater at http://www.bluewater.com.ph.